Google Play Gift Cards are now available! 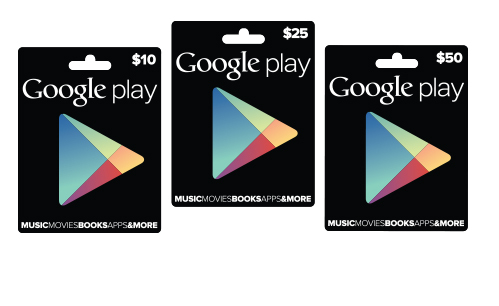 From rumor to official in less than a week, Google has announced Google Play Gift Cards for its Play Store. They are available now and you can find them at Gamestop, Radioshack, and Target stores. According to Google’s official page you can use these gift cards to buy anything in the play store with the exceptions of app subscriptions, magazines, and Google Hardware (read Nexus devices). Though Google’s Android OS is the most used smartphone OS, Android tablets haven’t quite taken hold yet. Hopefully seeing Google Play Gift Cards on the shelves next to itunes and amazon gift cards will help expose more people to the idea of using an Android Tablet over an iPad. Time will tell. Explore millions of songs from top artists, thousands of your favorite movies and TV shows, the world’s largest selection of eBooks, and much more. Play your purchases instantly on the web or on the go — no need for wires or syncing. Shop for all the Android apps and games you love with your Google Play gift card. You can even use it to purchase extra levels, add-on packs, and virtual currency. So what do you think of Google’s introducing gift cards to its online store? Do you think it will help? Tell us in the comments.